Dinner and a movie may never be the same thanks to a second luxury theater opening in North Bethesda this weekend. WASHINGTON — Dinner and a movie may never be the same thanks to a second luxury theater opening in North Bethesda, Maryland, this weekend. Boasting plush leather recliners and black-clad “ninja” servers who deliver food right to your seat, iPic Theaters joins ArcLight Cinemas in a new wave of opulent movie venues. iPic opened its first theater in 2007 and has since expanded to include 11 cinemas. The new Bethesda location is part of the upcoming Pike & Rose mixed-use development, which will feature several restaurants, a Sport & Health club, a Hilton hotel and PerSei luxury apartments. Like the new ArcLight Cinemas, iPic operates on a largely digital platform. Audience members buy their tickets in advance through the theater’s website, allowing them to skip pesky box office lines and reserve guaranteed seats from home. Those seats come in two options: You can choose between 33-inch premium leather seats that come with a table and range from $11 to $13 or “premium plus” reclining seats that cost $17 to $22 and include a pillow, blanket, unlimited popcorn and an iPad for ordering food and drinks. Concessions include high-quality finger food such as lobster rolls and Bao buns filled with short ribs and pickled vegetables; they can be ordered in the lobby if you purchase regular seats or via iPads inside the theaters for those sitting in premium plus rows. “All the seats are laid out so we never have to get in front of you … to give you that perfect experience of watching the movie,” Lee says. The menu was created by James Beard Award-winning chef Sherry Yard. She is also behind City Perch, a sit-down restaurant inside iPic’s lobby that opens in mid-November. It features 200 seats and an outdoor terrace with three fire pits for chilly nights. City Perch is Yard’s first restaurant after working for Wolfgang Puck for nearly 20 years. It “will be very chic,” Yard tells the Washington Post. iPic opens in Bethesda Oct. 31. 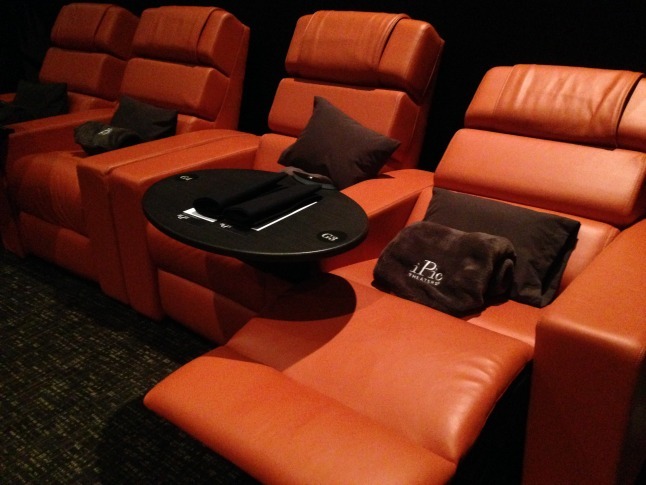 Click through the gallery to get a taste of iPic Theaters.